May 7, 2013-Supporters, through online voting, have won a prize for Cocker Spaniel Resources Inc. DATCP 271893-DS, Hudson, in The Animal Rescue Site’s 2013 $100,000 Shelter+ Challenge in conjunction with Petfinder. The animal welfare organization came in second in the state’s tally of votes, earning the group 100 vaccinations for the animals in its care. A complete list of all winners can be found at The Animal Rescue Site, www.theanimalrescuesite.com. GreaterGood’s The Animal Rescue Site has funded more than $1.3 million in grants to shelters and rescue groups since the Challenges began in 2008. The funds for the grants come from The Animal Rescue Site’s innovative Click to Give(tm) program and site sponsors. Cocker Spaniel Resources Inc. DATCP 271893-DS posts its adoptable pets online at www.petfinder.com/shelters/SHELTER WI271.html. the Fund for Animals’ animal sanctuaries, the International Fund for Animal Welfare, and other worthy animal care facilities supported by GreaterGood.org. Petfinder.com is the largest online, searchable database of animals that need permanent homes. With more than 300,000 adoptable pets from over 14,000 animal shelters and rescue groups throughout the USA, Canada and Mexico, Petfinder.com has facilitated more than 20 million adoptions since it was launched in 1996. In addition to being an adoption database, Petfinder.com is an all-inclusive resource guide for how to select the right family pet and build a successful, life-long relationship. Thanks to its sponsors, Petfinder.com is free to both visitors and to its animal placement organization members. Sponsors include BISSELL Homecare, Inc., a manufacturer of home cleaning and floor care products, Petfirst Healthcare, the exclusive pet insurance provider for Petfinder.com, and HomeAgain, a microchip and pet recovery service. 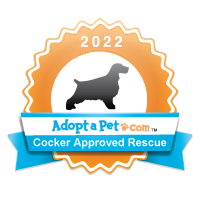 Tags: Aniaml Rescue Site's Challenge WinnerCocker Spaniel ResourcesInc.